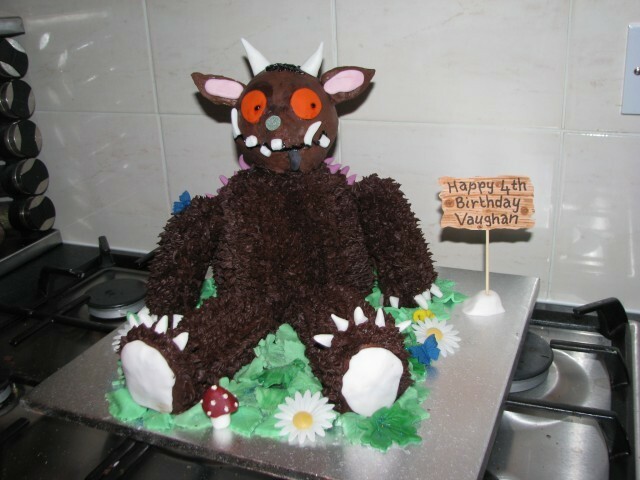 My son wanted a Gruffalo cake for his 4th birthday. It was such fun to make and far easier than I expected! 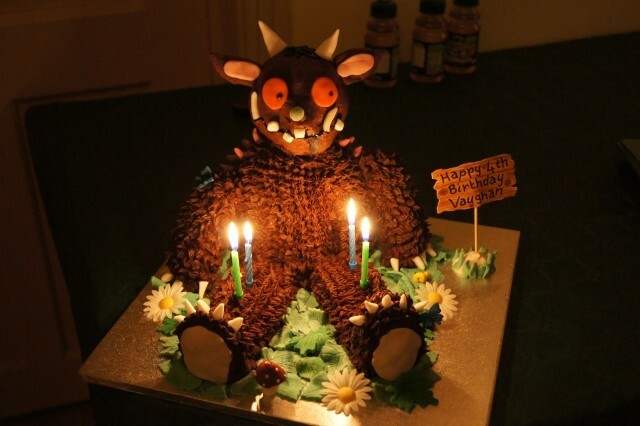 It was a perfect addition to his Gruffalo themed party. I baked a dome shaped cake in a rounded cake tin and 3 small circle layers. Using vanilla butter cream, I sandwiched the layers together. I used a regular sponge cake recipe, but any dense cake (easier to carve) will do. 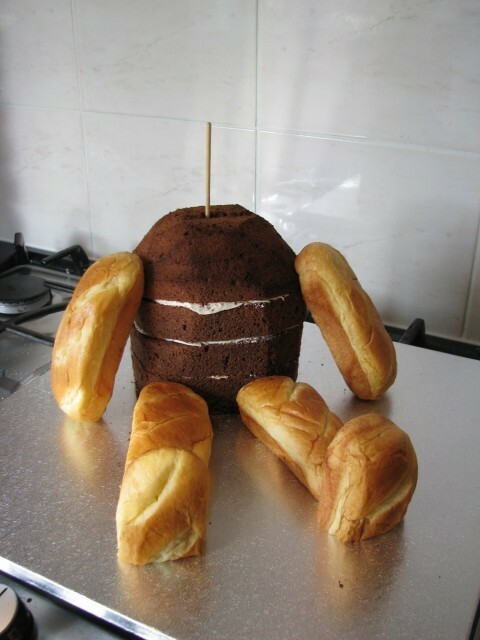 The arms and legs are small cream filled cakes (store bought) like Twinkies or brioche rolls which I attached with small (cut) skewers. The wooden skewer went right through the cake from bottom to top and served as the attachment for the head. I roughly covered the entire cake in brown chocolate butter cream. After roughly covering the entire body shape, I used a piping bag and a cake decorating nozzle to make little piped shapes which mimicked the fur look I wanted. 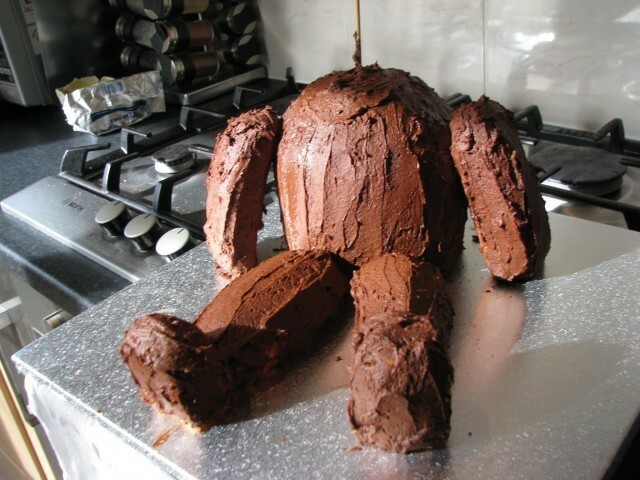 To make the head, I used all the bits of cake I had carved off the body and a decent amount of chocolate and the left over vanilla butter cream. I mixed them all together and then I rolled the mixture into a head shape and had some fun molding the nose/snout? shape. I made the horns out of white fondant and using a variety of other colours, I used cutters for the leaves and butterflies. I made a few toadstools and bugs to decorate the base of the cake. 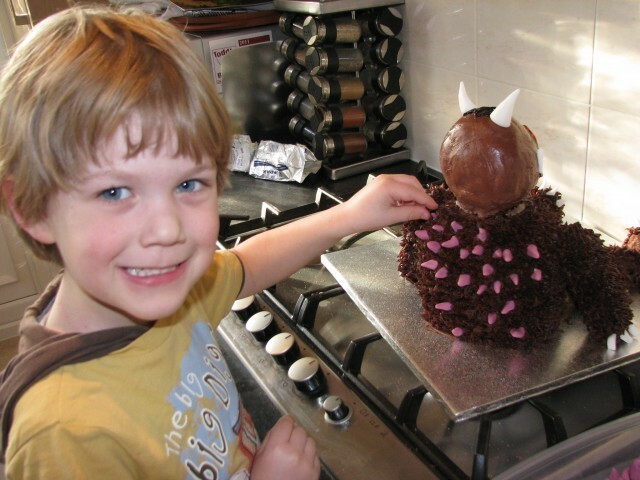 I made a huge pile of purple prickles and had my little guy place them all over the Gruffalo’s back. 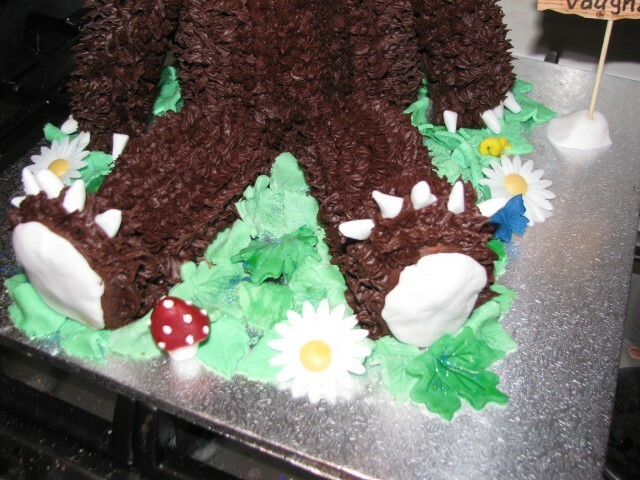 The ears were cardboard cut into the right shape and covered in fondant. I used orange fondant and a circle cutter for the eyes. The black dot is from a small tube of writing icing. The tusks are white fondant again shaped by hand. The black tongue is black fondant shaped to hang down and the black mouth line is the black writing icing again. 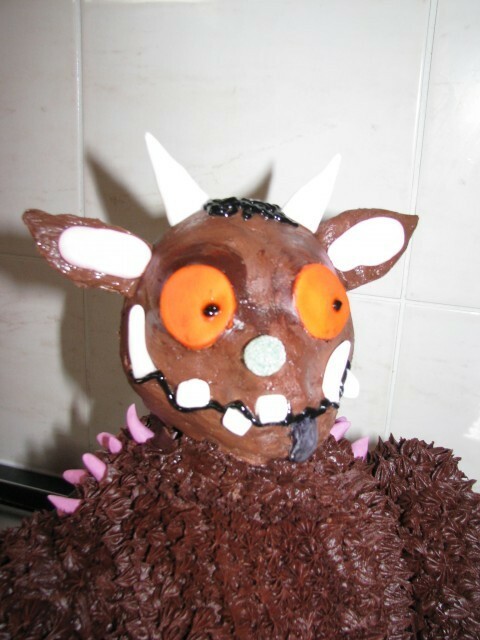 I used a green jelly tot for the wart on his nose, and gave him some scribbled hair using black writing icing again. When it was done I pushed it onto the wooden skewer that was sticking out of the body. Once he was at this stage, I placed the greenery and bugs around the base so that it looks like he is sitting on the forest floor. I also used cream coloured cardboard and some felt tips and pencil to make a wooden looking sign saying happy birthday. I attached it to a toothpick and then placed it into a mound of white fondant. A close up of the leaves and forest bits he was sitting on. 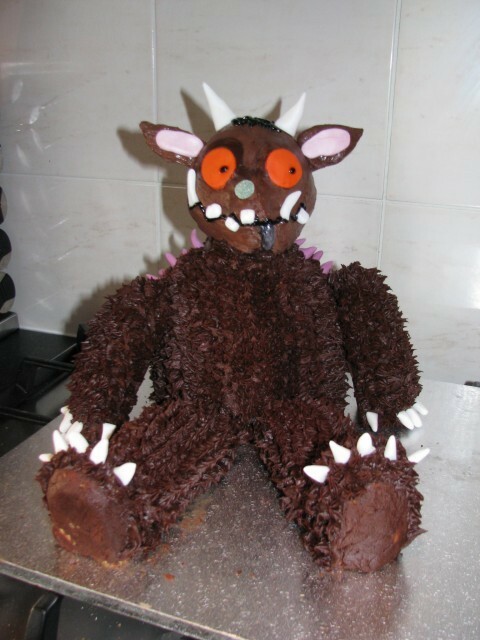 I hope you’ve been inspired to make your own Gruffalo cake for your child! Follow ToddleBabes’s board Awesome Kids Party Ideas on Pinterest.